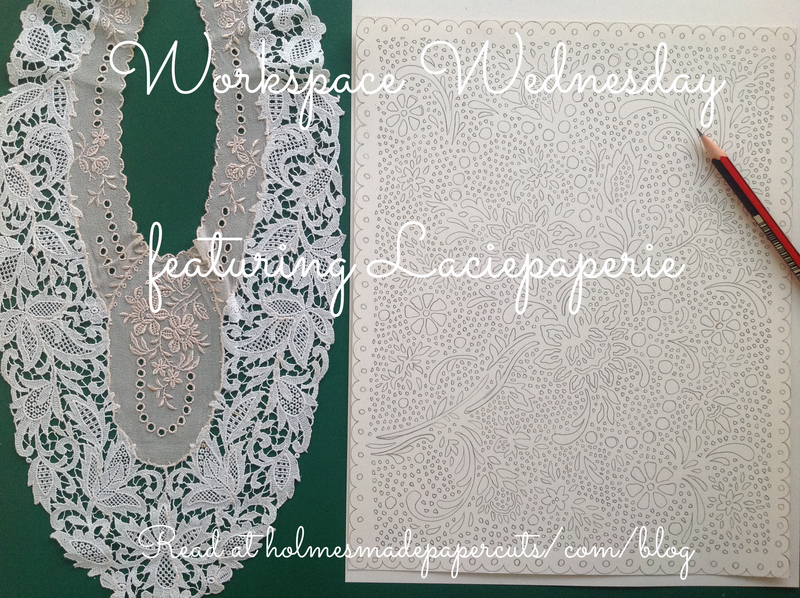 This week’s Workspace Wednesday features the wonderful work of Laciepaperie – otherwise known as Saffa Barkhordar. 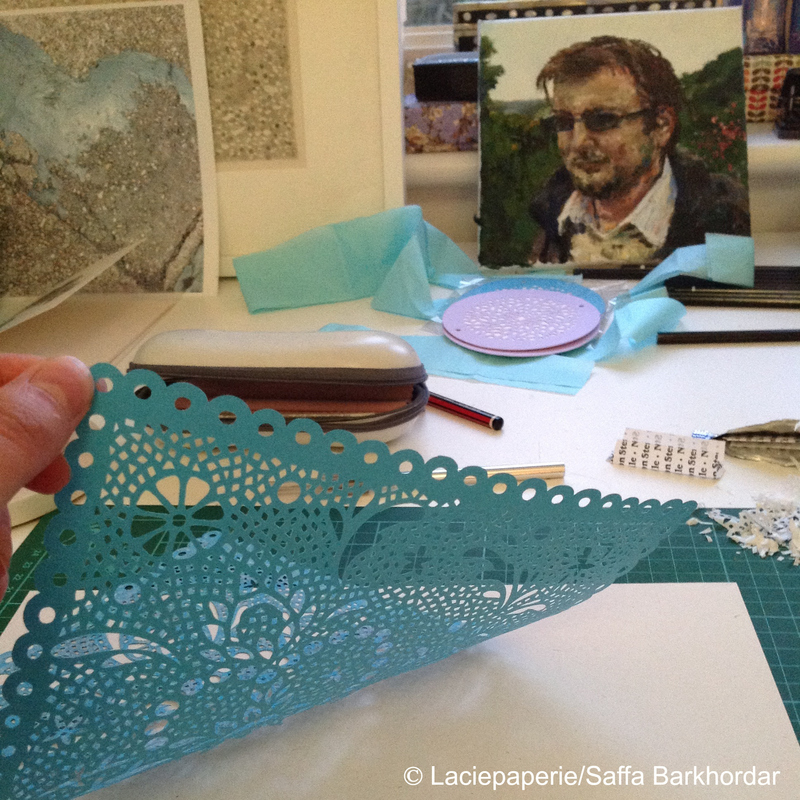 When she’s not at her office-based day job, Saffa works from a studio at home, creating intricate papercut designs inspired by the patterns of Victorian lace and nature. Here, she shares some behind the scenes info about her workspace and approach to work. You can find further info on Laciepaperie in the links section at the end of this post. And don’t forget, if you’re a creative and you’d like to get involved with Workspace Wednesday to show holmesmadepapercut blog readers your corner of the world, get in touch! My workspace is set in a little spare room of a house we are renting. It mainly consists of an Ikea desk in front of a window. Before that, I used to do my art work on the kitchen table but that was quite impractical so I’m really enjoying the extra space! I share the studio with my boyfriend Henry, who is a painter and uses the other side of the room. We’ve both been using the space for about seven months but will leave in a couple of months so I’m cherishing using it. It’s the first time I’ve ever had a studio space to do my papercutting and drawing in. I have a plain Ikea desk which is home to my cutting mat and equipment for papercutting and drawing. I don’t currently have any storage units, just lots of boxes under my desk containing my paper and materials. It’s not ideal but it’ll do for now! Because it’s a rented place, I haven’t been able to put things on the walls but have instead placed meaningful objects around my desk. One of my favourite things is a self-portrait of my boyfriend Henry, which he painted. I also have loads of pencil cases and collections of paper everywhere. It’s quite a minimal space but has everything there for me to do my art work. I love it. It’s wonderful to have a place to make my work in. It has natural light, so is very practical. I work part-time and feel lucky to have some time to make my art each week. 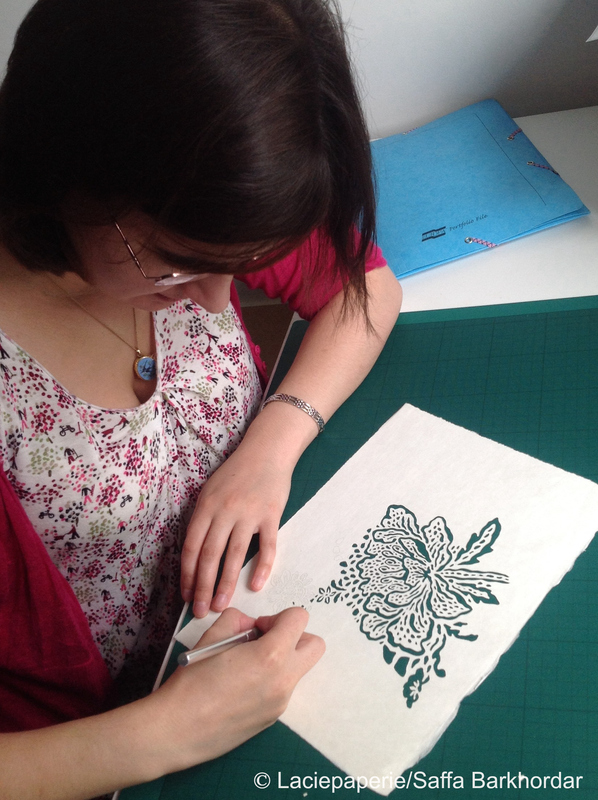 My papercutting work is an escape from work and the ‘daily grind’. Last year, I was working two jobs and had no time to make anything so I feel lucky at the moment. If I have a day off from my regular job, I get up quite early (about 6am) slowly gain consciousness and bumble into my studio. After several cups of tea I tend to put Radio 4 on or some music and get started working on drawing or papercutting. I can spend several hours at a time working solidly on a piece – it is very absorbing. I tend to work in a creative mess – there are usually lots of different projects going on and lots of paper everywhere. I find papercutting quite relaxing and it helps me to let go of my worries, I can just focus on it and nothing else. It’s probably the time I feel most happy and free. What’s your one must-have tool in your workspace – the thing you use most of that you wouldn’t be able to do your job without? All I need is some paper, a scalpel, a pencil and rubber. I love my workspace as it’s quiet and all mine; no one else is using my table so I can leave out work and materials. My least favourite thing about it is that it’s quite small, the printer I have is right next to the table so it’s a bit cramped. I’d also love to have somewhere to put all my paper; some good storage to free up the space around the desk. But I’m so grateful at the moment to have a studio space that these things don’t feel that important really. As we are moving quite soon I don’t know what will happen, whether I’ll have a workspace in the future. I might end up on the kitchen table again! But I hope I can still rent somewhere with a space to make my work in, that would be ideal. I’ll keep going with my art no matter what. Determination is everything! Don’t forget, if you’re a creative type and fancy showing off your workspace, get in touch!